Cardinals are high ranking ecclesiastical officials in the Roman Catholic Church (and some other Episcopalian organizations) who play key roles in church governance. Derived from the Latin term cardo (meaning "hinge"), their title and position is indicative of the pivotal role that these figures play in church administration, especially during times of transition between popes. The College of Cardinals, containing three internal divisions, is responsible for electing new popes. Cardinals also run the Church's archdioceses as well as the Roman Curia. ...we decree, according to the authority of the Fathers, that at the death of the Pope, the cardinal bishops shall first treat of the elections, after which the cardinal priests may be called in, and it shall finally be consented to the other clergy and to the people. However, during medieval times, the Roman nobility acquired influence to interfere with the selection of a pope. Occasionally, leaders from other countries also attempted to interfere with the pope's ability to exercise and maintain his power. In post-Enlightenment Europe, English and French monarchs had cardinals as their chief ministers—Wolsey in England, and Richelieu, Mazarin, and Fleury in France. These men were made cardinals not because of their religious duties, but because doing so allowed their kings to pay them from church monies. Rome accepted the loss of some funds in order to protect the rest of its property and revenue. Pope Sixtus V (1521–1590) limited the number of cardinals to 70. Pope Pius XII (1876–1958) chose not to name new cardinals during World War II, and the number of cardinals dwindled to 38. He dispensed with the complicated papal conclave procedures, which attempted to ensure secrecy while preventing cardinals from voting for themselves. He compensated for this change by raising the requisite majority from two-thirds to two-thirds plus one. He also held what has become known as the "Grand Consistory" on February 18, 1946, which yielded the elevation of a record 32 new cardinals (previously, Pope Leo X's elevation of 31 cardinals in 1517 had held this title). Together with the first post-war consistory in 1953, the "Grand Consistory" brought an end to over five hundred years of Italians constituting a majority of the College of Cardinals. In 1975 Pope Paul VI established an age limit for electors and raised the number of cardinal electors to 120. Pope John Paul II elevated an additional 31 cardinals in a consistory on October 21, 2003, bringing the number of cardinals at that time to 194. At the time of John Paul II's death, 117 of the 183 cardinals were young enough to be electors. the Diaconal Order (Cardinal Deacons). This structure originated in the reform of Urban II (1088–1099). Originally any Catholic male could be appointed to the College. For example, in the sixteenth century Reginald Pole was a cardinal for 18 years before he was ordained a priest. Today Canon Law 351 specifically requires that a cardinal must hold the order of priesthood. Those who are not already bishops must receive Episcopal consecration. Normally, only bishops can be established as cardinals. A recent exception is Avery Cardinal Dulles, a member of the Society of Jesus, who was a priest when he attained this position in 2001. He successfully requested of Pope John Paul II to be excused from the requirement of Episcopal consecration due to his advanced age. Although he is not a bishop, he is still entitled to wear the Episcopal vestments and regalia of miter, crozier, pectoral cross, ring, and he is allowed to have a coat of arms because he is a cardinal. However, his category is restricted to the lower two orders of cardinals. The pope assigns most cardinal bishops the title of a suburbicarian church. That group elects a Dean of the College of Cardinals to be the head of the college, the first among equals. The pope assigns each cardinal priest and cardinal deacon a church or deaconry in Rome. All cardinal priests and almost all cardinal deacons are actually bishops. The pope may also decide to appoint patriarchs of the Eastern Rite churches to the college. When appointed, they become cardinal bishops without holding a suburbicarian see. However, they cannot elect the dean or be elected dean. The election of the pope takes place in this manner. The cardinal bishops meet to discuss the candidates for pope. They decide upon several candidates who could qualify. Two-thirds of those gathered have to agree on the selection. The Second Council of Lyons decided in 1274 that those cardinals making this decision should meet in a secluded place within ten days of the pope's passing so they would not be disturbed by others while making this important decision. The pope could substitute another body of electors for the College of Cardinals at any time. For example, there were proposals in the past to have the Synod of Bishops perform this function. However, these proposals have not been adopted, primarily because only the pope can announce the meeting of the Synod of Bishops. In addition to the proclaimed cardinals, a pope may name cardinals by the Latin term in pectore, which literally means “in the breast.” It is said that only the pope knows these people's new position; the Holy Father does not even reveal this news to the candidates. Popes do this to protect the secret cardinals and their congregations from suffering attacks from angry enemies if their identities were known. Popes have the prerogative to announce these in pectore cardinals if their situation changes and such an announcement would no longer prove detrimental to the cardinal's safety. However, if the pope dies before he reveals the in pectore cardinal's name, that person's cardinalate expires, and no one is allowed to know who had held that position. For example, Pope John Paul II, named an in pectore cardinal during his tenure. That person's name remained secret up to the pope's death on April 2, 2005. Many people wondered whether the Holy Father would reveal the name of the in pectore cardinal before death. However, he did not do so, and the figure remains unknown. 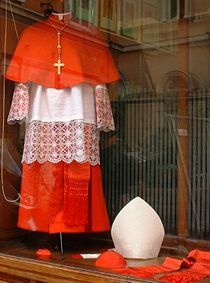 Cardinals gained their distinctive red dress and hat under the reign of Pope Innocent IV (1243–1254). The cardinal's formal garments include the rochet, which is always white, and scarlet vestments: the cassock, mozzetta, zucchetto, and biretta. For common or everyday clothing, a cardinal wears a black simar with a scarlet sash and trim. The bright color, which is the shade of blood, symbolizes a cardinal's willingness to die for his faith, if necessary, like Christ and the saints. It is also similar to the color of the cardinal birds for which they are named. Cardinals also wear a ring, a symbol of eternity and commitment, which the Catholic faithful traditionally kiss when they greet a cardinal. This is done to portray their respect for the position of cardinal and of the authority in the faith that comes with the position. Cardinals are known as "princes" of the Church. If the cardinal does not hold the position of bishop, he is not allowed to have a bishop's ceremonial privileges. Cardinals place a scarlet galero with thirty tassels, the ancient symbol of their office, above their coat of arms. Since 1630, cardinals have been addressed as "Eminence." When they are elevated, the word "Cardinal" becomes part of the prelate's name, traditionally preceding the surname. For example, the full style of Cardinal McCarrick is "His Eminence, Theodore Cardinal McCarrick, Archbishop of Washington." Darras, J.E. A General History of the Catholic Church from the Commencement of the Christian Era to the Twentieth Century. P.J. Kennedy. 1898. Kittler, Glenn D. The Papal Princes: A History of the Sacred College of Cardinals. Dell. 1961. Tobin, Greg. Selecting the Pope: Uncovering the Mysteries of Papal Elections. Barnes & Noble Publishing. 2003. Van Lierde, P.C. and Giraud, A. What Is a Cardinal? The Twentieth Century Encyclopedia of Catholicism. Hawthorn Books. 1964. Miranda, Salvador. The Cardinals of the Holy Roman Church. This page was last modified on 10 January 2017, at 20:53.